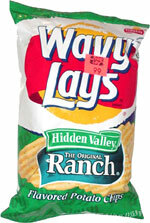 Taste test: These are good ranch chips with wide ripples. Smell test: Ranch chips smell, not bad. This snack was discovered by Jeremy at Adventures, Framingham, Massachusetts. Review published .